Wright State has been named among America’s top disability-friendly universities in a new nationally distributed book designed to help disabled high school students select a college. According to College Success for Students with Physical Disabilities by Chris Wise Tiedemann, Wright State and four other schools go above and beyond the rest in making independent living possible, offering the most supportive environments for students with serious physical disabilities to live on campus. The others are the University of California at Berkeley, the University of Illinois, the University of Houston and Edinboro University of Pennsylvania. The book noted that Wright State has accessible housing, accessible transportation and a tunnel system that connects all of the academic buildings. In addition, the university has personal care attendants, wheelchair sports and a good online guide to help disabled students prepare for college. 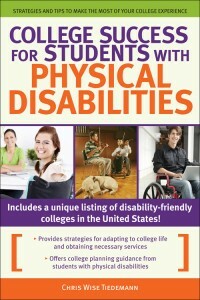 “Students with disabilities do experience college success, but they must begin the college search as early as they can, understand how college will be different than high school, learn solid self-determination and self-advocacy skills and, if possible, plan and prepare for that transition from the early years of high school through the first semester of college,” Tiedemann wrote. Among those whom the author interviewed for their insights into college success was Jeffrey Vernooy, director of Wright State’s Office of Disability Services. “The ranking both represents the university’s desire that every student has a right to a college education and that severe physical disabilities should not stand in the way of being educated and becoming a productive member of society,” Vernooy said. The cover of the book features a Wright State student and professor, In-Hong Cha. Cha has been the feature of two long documentaries on his life and success. Visit http://webapp2.wright.edu/web1/newsroom/2011/11/04/music-department%E2%80%99s-cha-the-subject-of-second-korean-documentary/ to read more about Cha’s story.